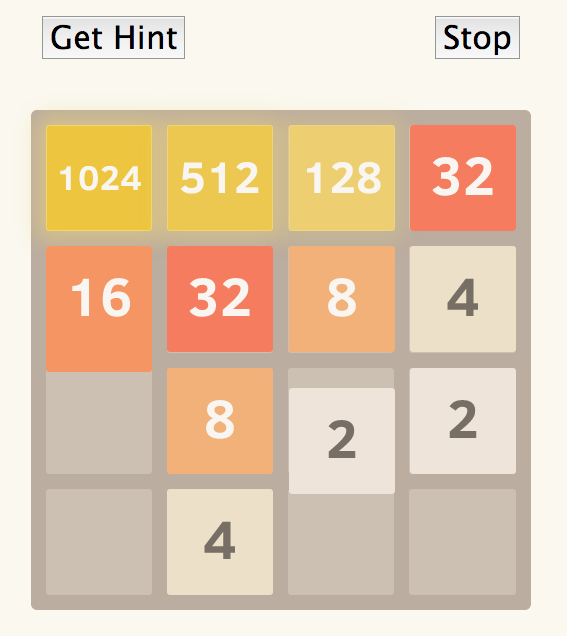 A friend downloads this game called Threes a couple weeks ago. It’s currently $2 on iPhone and Android. My friend called it the Tetris of our day, and, I have to admit, it is easy to understand, challenging, and fun. Before getting the chance to write about it, an interesting lineage of clones appeared. Cloned. The basic mechanic that has been reproduced is the adding of (matching) numbers within rows and columns, depending on direction of swipe. 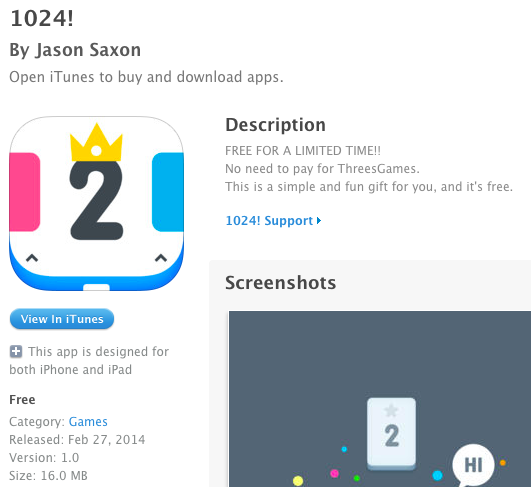 Soon after, a game, which could’ve been named “Twos,” called 1024 emerges with a similar art-style. I did a bit more research to find the author of the viral game on Hacker News (four days ago). 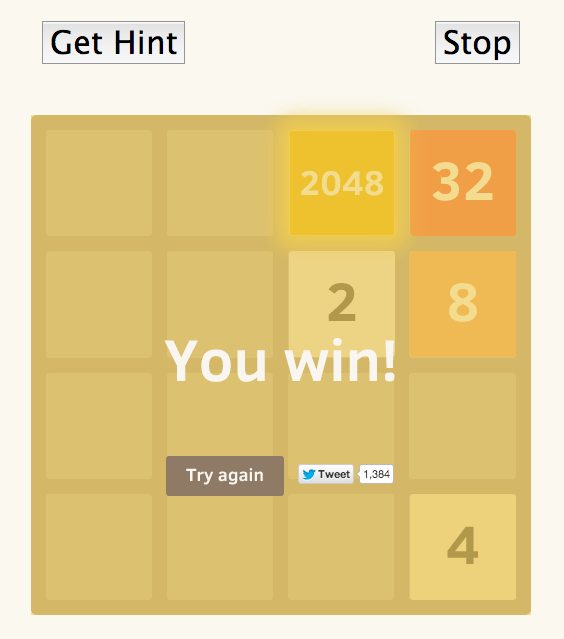 I made this game as a fun weekend project, inspired by another game called 1024 (https://itunes.apple.com/us/app/1024!/id823499224) and a spinoff called 2048 (http://saming.fr/p/2048/). I did mine to add animations to the latter, which was a bit hard to play without them. EDIT: Make sure not to get addicted! EDIT 2: The game now has swipe gestures and vim keys support (added by @rayhaanj)! What I gather to be the clone lineage of Threes. The difference between gabriele’s and ov3y’s is hard to detect at first, but if you look at the top, there are two additional buttons for “Get Hint” and “Auto-run/Stop.” You can basically watch ov3y’s AI beat the game before your eyes. The algorithm is iterative deepening depth first alpha-beta search. The evaluation function tries to keep the rows and columns monotonic (either all decreasing or increasing) while aligning same-valued tiles and minimizing the number of tiles on the grid. For more detail on how it works, check out my answer on stackoverflow. 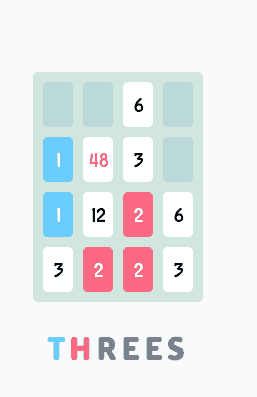 It’s great that Threes creates such a new experience that’s simple, challenging, and fun. In context, it seems quite common, but still feels a bit messed up to copy someones game and then give it away for free with the tagline of: “why pay for it, when you can get it for free?” Pretty smart move though, from a $$ point of view. 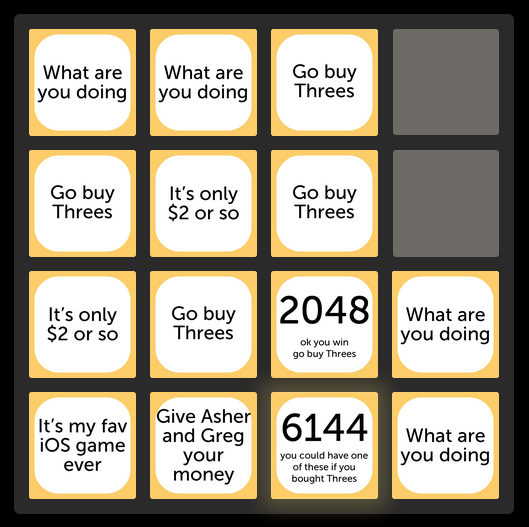 Tags: 1024, 2048, ai, alpha-beta pruning, Android, artificial intelligence, casual games, clones, github, iphone, puzzle, threes, threes game. Bookmark the permalink. Reblogged this on Cyborg 24.